Collins Booksellers - 4,000 Questions for Getting to Know Anyone and Everyone, 2nd Edition by Barbara Ann Kipfer, 9780375426254. Buy this book online. 4,000 ways to achieve instant intimacy. With new and updated questions! What, more than anything, makes you angry? What kind of leader are you most inclined to follow? What has happened to the art of conversation? In the age of the Internet, speed dating, and frantic text messaging, have we forgotten how to meaningfully connect? 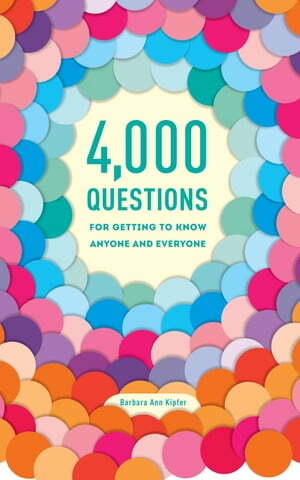 This book of 4,000 provocative questions will help you get to know anyone and everyone in every social situation. Use it to go beyond small talk at parties, networking events, dates, dinner tables, and road trips. It's for getting to know someone you just met and learning a lot more about someone you thought you already knew (who may be yourself).